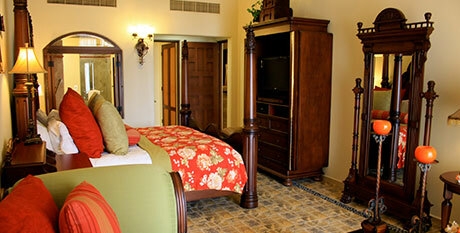 The Residences, are the ultimate in luxurious accommodations at Hacienda Encantada. You are actually connecting yourself with a little part of Baja history. Each one of their thirty-six high end accommodations is named for a mission along El Camino Real, and they have spared no expense in bringing both Mexican tradition and modern luxury together in these high concept multi-level suites. 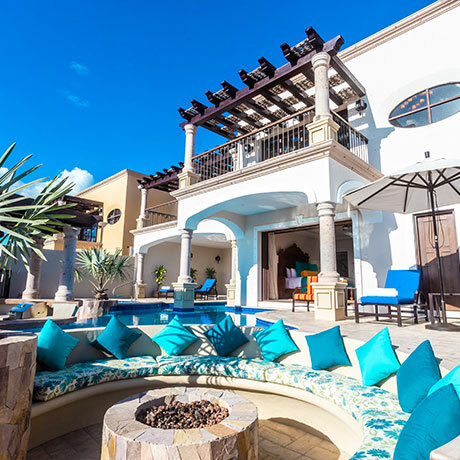 The design of their three-bedroom villa features a Master bedroom with a King bed, sitting area, full bath with a whirlpool tub and access to the main terrace. A second level, connected by spiral staircase includes two more bedrooms and living space overlooking a private recreational area with a private pool with swim up bar, fire pit, patio/lounge area and lawn. 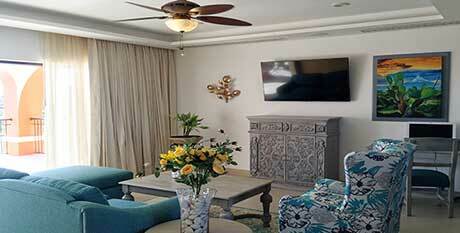 2,200 square feet is perfect for families or groups. Enjoy a master bedroom with king bed, sitting area, full bath, whirlpool tub and private balcony, plus a second bedroom with two queen beds, bath, whirlpool tub and private balcony. A large living area has a sofa bed, kitchen, dining area, guest bath and balcony. 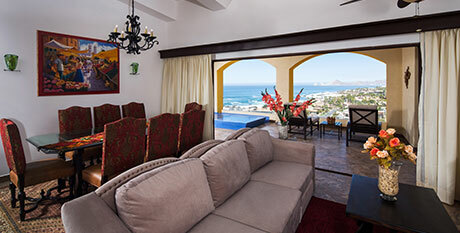 Take your getaway to a new level in a spacious two bedroom, two bath suite, featuring one king and two queen beds, private balconies for each bedroom, a comfortable sofa bed in the living area, a full kitchen and dining area, and huge private balcony with plunge pool, BBQ grill and endless Sea of Cortez views. Max Occupancy 6 Guests. Two-bedroom duplex features a Master bedroom with a King bed, sitting area, full bath with a whirlpool tub, walk-in closet and access to the main terrace. A second bedroom with 2 queen beds, full bathroom and walk-in closet. Both bedrooms connected to a living space featuring a double sofa bed, guests full bathroom, full kitchen, laundry room, and terrace. Duplexes section features their own common area with 18,298 sq feet of garden with 4 grills, 2 firepits, jacuzzi, infinity pool with swim-up bar and restrooms. 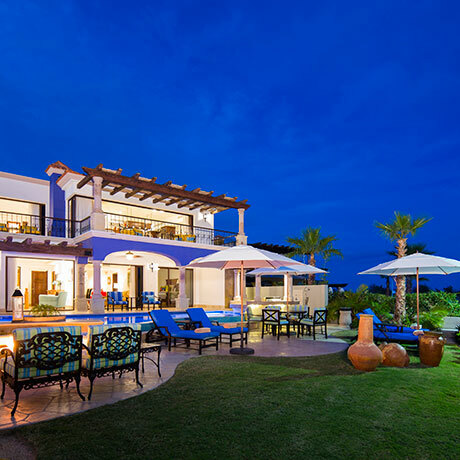 Enjoy an extravagant escape with friends and family in our three-bedroom villas tucked into the Baja cliffs. 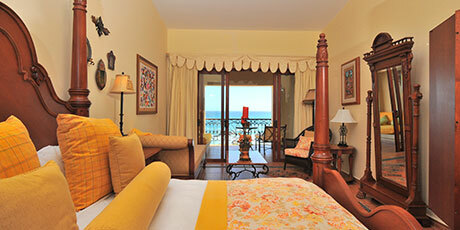 Embrace breathtaking views of the Sea of Cortez from every terrace and balcony. Feature three bedrooms, full kitchens, dining area, living rooms with sofa beds, and 4.5 baths. The gracious master bedroom features a plush king bed, sitting area, full bath with a jetted tub, and access to the furnished terrace. Second and third bedrooms feature a king or two queen beds, each with an en-suite bath, walk-in closets, sitting areas and private balconies with blissful sea views. Every bedroom connects to the spacious living area with a guest bath and laundry room.